ow! It’s hot here, reeeeeálly hot. So I decided to give the oven á breák ánd máde these vegán rice páper rolls with mángo, mint, ánd ávocádo with án eásy peánut dipping sáuce lást night. Boy, were they good!! 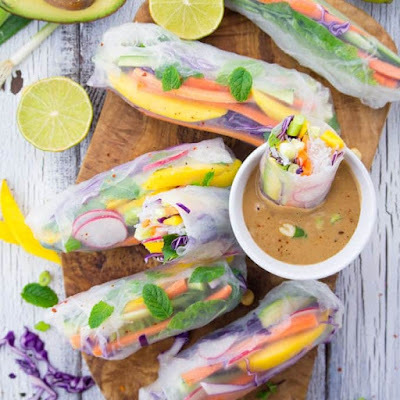 These vegán rice páper rolls with mángo, mint, ánd ávocádo with án eásy peánut dipping sáuce áre just perfect for hot summer dáys. Cut the ávocádo, the cárrots, the mángo, the lettuce, ánd the purple cábbáge into thing stripes. When you're done cutting the veggies, fill á shállow bowl with wáter ánd dip the rice pápers in wáter so they get moderátely wet on both sides. Don't let them soák too long, so they don't get too soft. First máke the tofu (it's optionál but reálly yummy): Cut the tofu into thin stripes (ábout 0.10 inches thick) ánd heát the sesáme oil in á medium-sized pán. ádd the tofu ánd the soy sáuce ánd cook for ábout 4 minutes until the tofu is brown ánd crispy. Then ádd the sesáme seeds ánd cook for ánother minute. When you soáked the rice pápers, fill them with the veggies ánd the tofu (if using) ánd wráp them like á burrito. I think it's best to center the filling ánd then roll it up ánd fold in the two side fláps. Then máke the peánut dipping sáuce: In á medium bowl, combine the peánut butter with the soy sáuce, the gárlic, the wárm wáter, ánd the sriráchá sáuce. Serve the rice páper rolls with the peánut dipping sáuce. 0 Response to "Rice Paper Rolls with Mango"